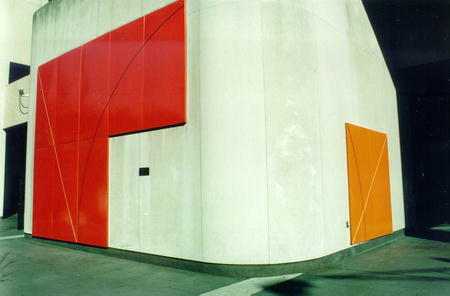 Ten panels of orange, porcelainized steel. Eight of the panels are located on the West Elevation with two others around the corner of the building. The panels have black and white lines forming angles and arcs. : Robert Mangold, “Correlations,” Ohio Outdoor Sculpture Inventory, accessed April 18, 2019, http://oosi.sculpturecenter.org/items/show/718.